A hint - NOT HERE (and I'm not just talking this blog. Today is one of my technology fast days). I've got TWO posts on TWO different blogs today. Hope you'll stop by and check them out. 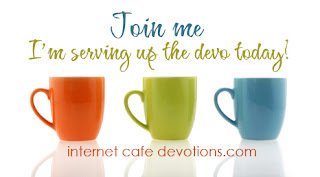 At Jewels of Encouragement, I'm talking about doing things for God's glory - or not. Did you know that you can be selfless selfishly? Learn what I'm talking about (and how to avoid it) at JoE. Today is also my day at Internet Cafe Devotions, and I'm talking about everybody's favorite swallowed prophet - and, I have to admit, how often I act like he did. How often I go in the wrong direction. How about you - are you headed for Ninevah or Tarshish?